Matching colors, it’s a trick. In our business, we spend a lot of time trying to match exact colors, trying to find colors that complement others extremely well and finding colors that appeal to our customer. There is no easy way to go about it, especially since balancing any two of these items can be tricky enough! Over the years though, we’ve developed a few tricks for matching and pairing color. Today we’re going to share three tips that may you find the right matches for your Kansas City area home. Color is actually a complex field of study. Specialists can help you match colors that create feelings and different energy patterns that work for your aesthetic. While these services are surely valuable, most people don’t seek a color guru or even a designer, they just need to know how to make reasonable, workable color decisions. Understanding color basics can help immensely on this search. Complementary colors are directly opposed to each other on the color wheel, and can make pleasing accents to each other. 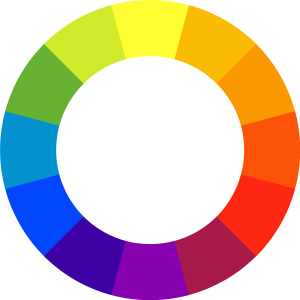 However, we find that for projects involving a lot of painting, it’s best to stick with analogous colors, which are the colors right next to one another on the color wheel. These slight modifications in color tone can create interesting color harmonies that preserve the feeling of a space without losing the continuity of the primary color. Think that you have to paint to create an interesting space? You don’t. Instead of painting an entire space, consider the way that you decorate the space and the colors that are used for this purpose. Objects used for decoration can be just as powerful as permanent fixtures. In throw pillows, blankets, watering cans, grill covers, etc. you can create add the accents and the energy without all the hassle. Don’t be afraid to use a matching color too for the purposes of decoration or painting. Using a color that matches the overall room color can create a story just as interesting as using a complementary or analogous color. You just have to try it and see what works for you and for the space! If you’ve lost the original paint and mixture formula for the exact color match it shouldn’t be a problem. Thanks to modern technology, most hardware stores and specialty paint stores are able to match colors nearly exactly. The machines they use measure color and mix the paint themselves, taking human error out of the equation. Just take a sample of the color that you want to match into the hardware store and ask for them to color match the paint. Learning about color and applying it to your home, your deck and your patio can really make it a special place. Don’t hesitate to play with color and see how it makes you feel while you’re enjoying your favorite outdoor space! Sure, we’re deck builders, but that just means we already have all of the equipment we need to make delivering gravel and mulch to your Overland Park, Independence, Olathe, Shawnee, Lee’s Summit or Kansas City area home a breeze! That’s right, we’re now offering delivery and installation services for mulch and gravel anywhere in the Kansas City metro area. It can be a real pain to get mulch and gravel to your home. 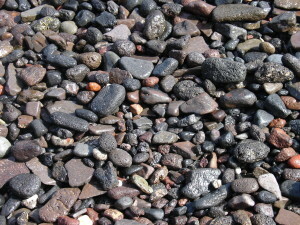 When you shop at a garden store or a hardware store, you can probably find the type of gravel or mulch that you want, but the next step is getting it where you want it. This means that you have to have the right kind of vehicle, or that you have to rent one, or that you have to ask friends and neighbors for help. We think that’s a lot of hassle for something as simple as gravel and mulch, and that’s why we’re bringing it directly to you, our loyal customers. Plus, lets face it, bags of mulch and gravel aren’t light weight. When you hire us to deliver and install it for you, you don’t have to deal with all of the heavy lifting when you load it into your car. You don’t have to deal with it when you unload it from your car. You don’t have to deal with multiple trips to the store to get more (also meaning more lifting). And, with our installation services, you don’t have to spend hours hunched over trying to avoid getting pricked by your bushes – we take care of all the hard work for you. You’ve seen the caliber of the decks we build, now give us a chance to show you how amazing your landscaping can look, and how little effort it takes on your part to make it look great! 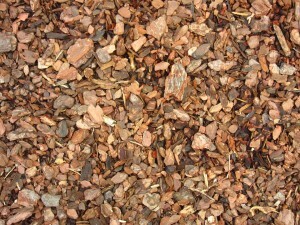 See our Mulch and Gravel delivery page for more information. Outdoor living is an admittedly broad term. It can encompass everything from sport to lounging on the deck. But one thing it almost always ends up including, being that we’re human after all, is food. One big reason we spend so much time eating indoors in simply the convenience of it. We cook in indoor kitchens, and it makes sense to eat nearby indoors as well. The latest homes though are starting to encourage outdoor living by including outdoor kitchens. Complete with cooking surfaces and counter space, the outdoor kitchen is quickly becoming the focal point of cookouts. As opposed to the grill, the outdoor kitchen is actually installed into brick and mortar, providing protection from the elements and making it a permanent upgrade for the home. In many cases, the utility of the kitchen is only matched by its outward appearance. Outdoor kitchens look great, and make it easy for homeowners to justify having one installed, especially when it comes time to sell the home. From the small to the grandiose, outdoor kitchens are becoming a part of what today’s homebuyers are seeking. Since most homes aren’t built with Outdoor Kitchens installed to begin with, having one shows that a homeowner has put care and attention into maintaining and improving their property. In this way, an outdoor kitchen that was installed after the home was built can be a signal that the property is in good condition (of course, that’s not a guarantee). But more importantly, it gives the new homebuyers a space to fully use outside – wether having friends over to visit, or simply enjoying an evening on the patio with the family. Having the spaces to prepare, cook and serve food, are factors that make any place livable. An outdoor kitchen essentially enables homeowners to turn an outdoor space into an outdoor living space – and to do it in style! This family had us build their deck in the fall so it would be ready when next season starts! Well, it’s been a beautiful long summer and fall! How exciting that it all came to a conclusion with a World Series win by the Kansas City Royals! But now it’s time to settle back in for the conclusion of fall and the beginning of winter. If there’s one thing we always count on, it’s that the weather will get colder and people will be spending less time outdoors. Our busiest season, as you can imagine is late spring through summer. While that seems to make sense with people thinking about and enjoying being outdoors again, it also means that we’re busy building or replacing decks for people who would rather be actually using them! So our question of the day is: why build a deck in the summer when you want to be using it already when you can build it during the wintertime when it’s chilly and you don’t want to be outside anyway? Sure, it’s probably just a mindset thing – people just aren’t thinking about getting a deck built when they’re busy thinking about turkeys and gift-giving. But that’s part of why it’s also the perfect time for an outdoor home improvement project! When you work with us, we draw up the plans, get your approval and make it happen – the whole process is pretty painless. While you prep for the holidays inside, we build you a deck that you’ll be proud to talk to your friends and neighbors about. When the season warms back up, or when you feel like having a warm cup of coffee on your new deck in the winter, you’ll be set. Because we get so busy in the springtime, sometimes we have to put off builds until mid-summer. We’d love to get to every deck right away, but sometimes it’s just not feasible. The late fall and winter seasons are great times to get a deck built, not only do you not have to wait, but you don’t miss any precious time outdoors when the weather is actually nice again! Remodels can stress anyone out. 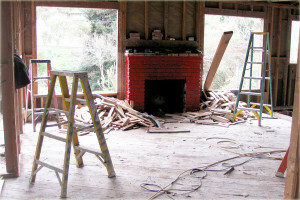 Remodeling can be a stressful time – from the planning through to the clean-up. Loud noise for days or weeks on end is enough to put anyone on edge, not to mention the missing space in your home and the costs. We have a few simple tricks that seem to help homeowners reduce stress and get and make it out the end of the remodel without too much lasting emotional damage. This simple trick makes everything go more smoothly. When there’s a plan, you always know that there is a light at the end of the construction tunnel. Before you sign any contracts with your remodeler or deck builder, get them to commit to a plan with delivery dates and associate those dates with payments. This creates a big incentive for a remodeler to finish a job on time. Delays may still happen due to unforeseen circumstances, so make sure to have a contingency plan in place with your remodeler as well. What this does is give you a sense of where the project will be on any given day. Armed with this information, you will feel less anxious about the progress of the job – you already have an agreement in place, and it’s in the contractor’s best interest to stick to it. Just knowing where everything should be makes the whole process much more bearable. We know remodeling is expensive, but have some kind of escape plan for when it gets to be too much. This can mean a getaway, but we suggest a staycation somewhere nearby. If you’re staying nearby you can check on the progress of the work without having to listen to it and live in it the entire time it’s happening. 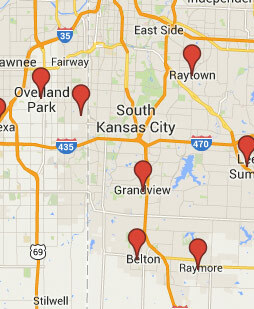 Think of it as an opportunity to see all the things the Kansas City area has to offer! Google search to get you started. This is a good idea in any circumstance – create a place that you agree with yourself to not lot worry or stress enter. When you’re in this space, you’re relaxed and not focused on the minutia of remodeling projects or any other stress for that matter. Agree that you’ll come to this place at least once a day for a half hour, and stick to the plan! It might be advisable to create this space far away from whatever remodeling work you’re having done is actually taking place though. If you plan ahead, you won’t have to stress! It’s that simple! It’s officially football season! We’re into the cooler weather, but not quite into full on fall yet – with only some of the trees starting to turn, there is plenty of time to enjoy the outdoors. We recommend combining the outdoors with football viewing, and have several suggestions for food for your outdoor deck viewing party! The perfect football food setup is simple to set up, easy to eat and pairs perfectly with the snacking habits of those involved. Football fans often snack during the commercials, so keeping portions small is a must, and with only a limited time to enjoy the creations, they have to be exceedingly tasty as well. Remember that we’re planning a deck viewing party here, and that means you’ll need plenty of warm snacks incase guests get chilly in the fall air. A couple of crowd pleasing favorites that are easy to make and feed the whole party include grilled sausages and kielbasa, garlic bread, wings and meatballs. Each is tasty, warm and perfect for grabbing during a timeout! While we’re certainly meat lovers, it doesn’t mean that everybody is. Hot cheeses make for perfect dipping sauces and can be really easy to make with a crock pot. Plus you can add a lot of different ingredients like red bell peppers, jalapeños and beans to your cheese to create a pretty tonge-tingling treat that’s uniquely yours. Breads are another easy way to snack that can be a somewhat healthier snack. Garlic break with a couple of different kinds of cheeses melted onto it is guaranteed to have them coming back for more. It’s the last of the warm weather for a while, so it’s time to get outside and enjoy it. 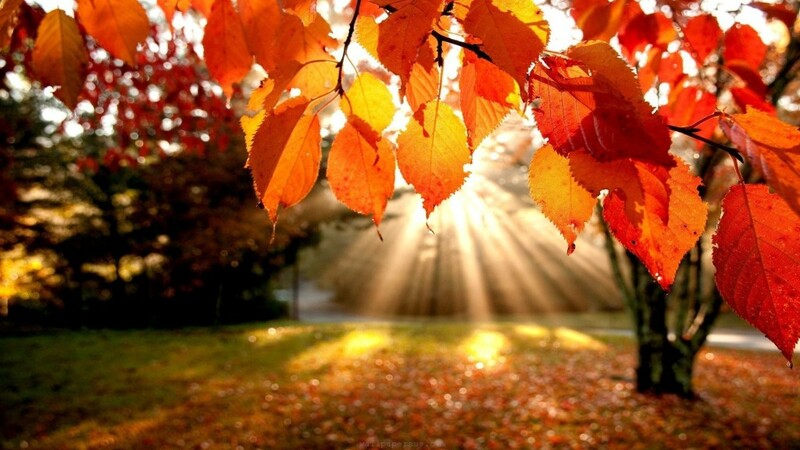 There’s no better time than when you’re surrounded by friends with beautiful fall weather! Make some chow for the gang, move the TV outside and get to cheering like an old pro! 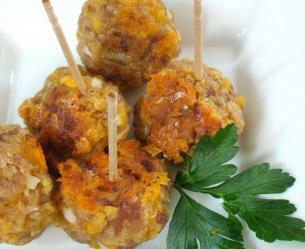 Need more football food ideas and recipes? Here’s a list of 32 more! It’s officially fall, and that means it’s time to say goodbye to late summer evenings and hello to fall housework. Since the weather really hasn’t started to get chilly yet, now is a great time to get started on all of the fall prep work ever homeowner needs to do before the cold temperatures set in. The information packed home blog at Charles and Hudson has put together a pretty thorough list of what needs to be done around the house before it gets cold. We’ll paraphrase here, but don’t hesitate to read the full article at their website. Gutters ain’t glamorous, but they’re really important to the health of a home. Your home’s gutter systems divert thousands of gallons of water a year away from your home – protecting your home’s baseboards, exterior surfaces and even the foundation. In winter, properly installed and maintained gutters are even more vital as their failure can lead to serious roof damage thanks to ice damming and other factors. Make sure water is flowing through them and away from the home. For those with older homes with large trees, it’s important to make sure that leaves aren’t building up in the gutters as well! Small holes can cause expensive problems for homeowners on their energy bills. Weather stripping around doors and windows can play a vital role in keeping your home comfortable and your energy bills down in all seasons. Because it does wear out, especially around doors, make sure to carefully check and replace it anywhere you find gaps or tatters. Also inspect your home’s windows for signs of small holes or other potential points for leakage. Roof problems get a lot worse when you hit cold weather. First, there’s the possibility of a leaking roof which is never good because of mold, rot, etc. In winter though, there’s an added problem of escaping heat. Because warm air rises, attics tend to provide a buffer between the lived-in portion of the home and the cold air around the roof. If there’s a hole in the attic, you’re losing this buffer and going to use more heat. In addition, damage already present will usually get worse if left over the winter. Water is what’s called a ‘polar molecule,’ meaning that it has some odd/interesting properties. In it’s liquid state, the molecules flow freely around one another, but in a solid state (ice), they push apart from each other as their molecular ‘buzzing’ slows down. To put it simply, there’s a reason you never put a can of soda in the freezer for an extended period of time, the water in it expands as it freezes and the can will eventually explode. Think now about water that gets into cracks in your concrete, freezes and then expands – it has no choice but to push on the concrete and grow the cracks. The laws of physics literally destroy your sidewalk or driveway. Fortunately, if you catch it now while it small and fill it (which is pretty easy), you’ll save a lot of headaches down the road! The list over at Charles and Hudson goes on for many more pages, so to make sure you get your home fully prepared, go check it out at their site! Differing materials used together create different effects and work well with varying senses of aesthetic. When two different materials with similar but differing qualities are used together the effect can be particularly striking. 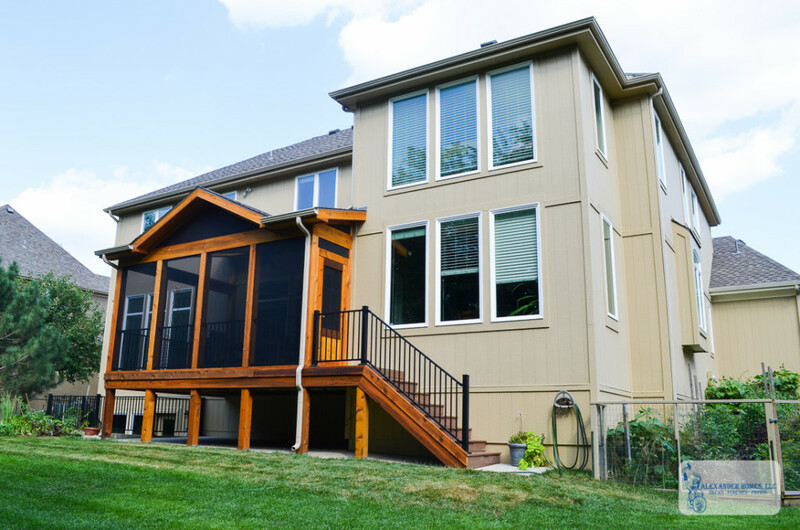 We recently completed a screened-in-porch in south Overland Park that did just this, combining durable, long-lasting cedar with low-maintenance, weather-resistant composite decking. The cedar on the exterior looks great and smells great. It provides the structural elements of the deck and is how the deck appears from the outside, looking almost like solid cedar. However, on the inside of the screen and just outside the exterior doorway, composite material makes up the majority of the deck floor. 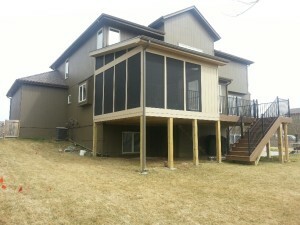 Those composite boards are really perfect the constant foot traffic that a deck entails. Composite has the advantage of being very easy to clean, not generally requiring power washing for all but the most extreme stains. When it comes to materials working well together, there is the functionality aspect and the form aspect. 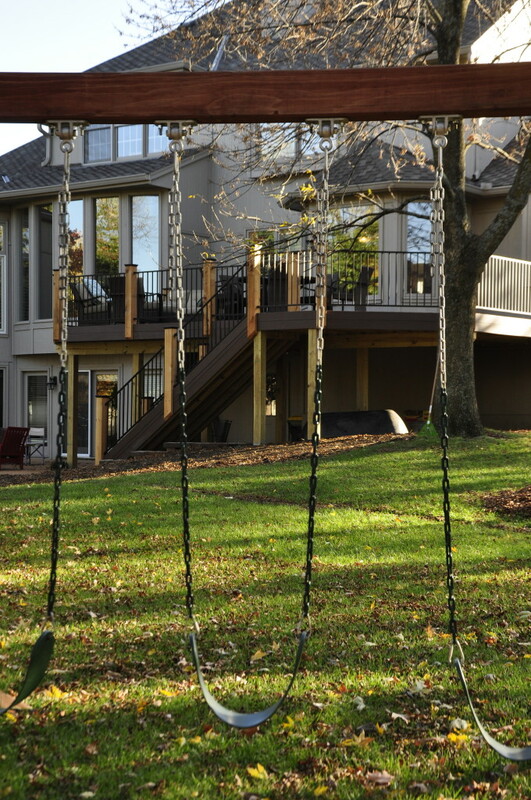 While function is the critical piece required for the structure to stand and support weight, why would anyone even have a deck or screened-in porch installed in his or her home if it doesn’t also look appealing. 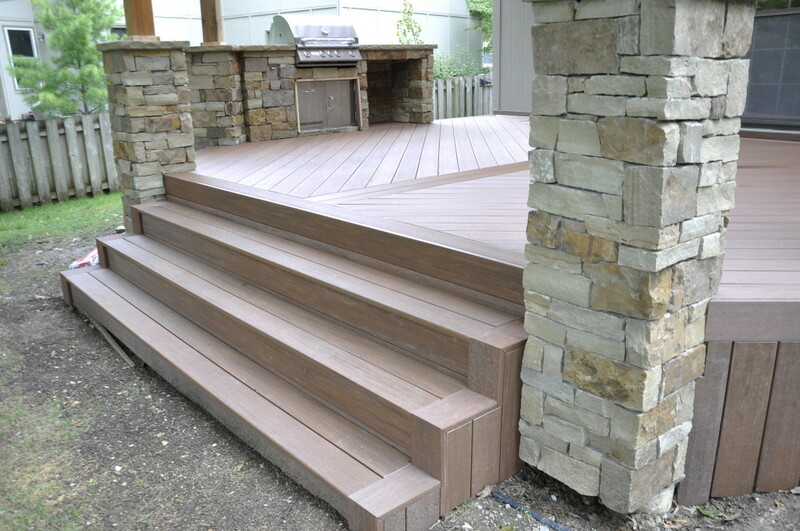 Picking appealing materials that coordinate well with one another is a key aspect of successful deck design. These homeowners are seeking to create a Colorado-like backyard escape in their neighborhood of Carriage Crossing. Instead of using wood pylons to hold the weight of the structure, they used natural stone coupled with natural looking composite materials. Soon, they are also planning to install a fire pit. 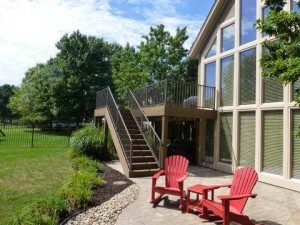 That natural stone pairs so well with the natural-looking deck that it’s hard not to feel like you’re gotten lost in the woods, not a subdivision in south-east Johnson County. Don’t be afraid to experiment and try the material combinations that work best for you. 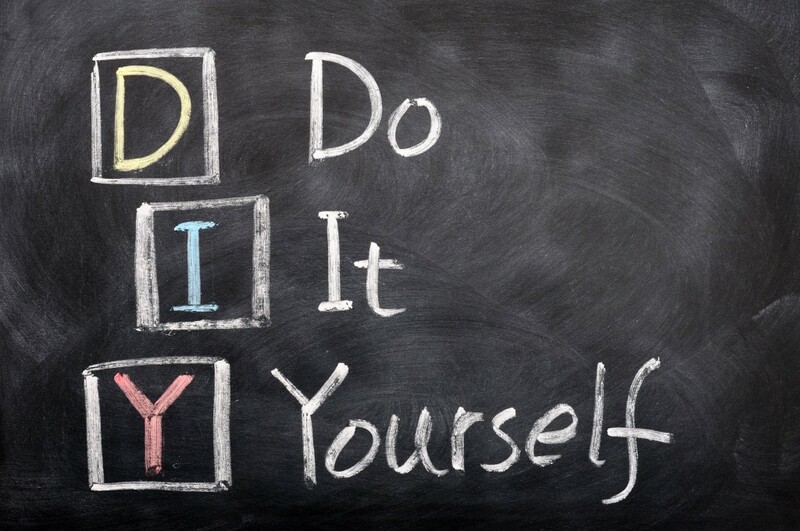 Every person who owns a home becomes a handyman. If we didn’t, we would be too poor to own the home because of the cost of the general upkeep, let alone home improvements. At the same time, most of us wouldn’t claim to be structural engineers and know when we need to call a real professional for major construction or repair work. Most homeowners could also repair and install more than they think, if given the proper advice and direction for the given task. Fortunately, there are resources out there to help those seeking to become the greatest handymen and women possible! A newer website that is really growing in popularity among contractors and DIY-ers is called BeThePro.com. This community is specifically set up to answer questions and share opinions about construction and repair. There have been sites like this before for professionals, but rarely have they encouraged people taking on projects themselves to ask or answer questions. Getting involved in this community means that you have a place to go when you need a second opinion, advice on the difficulty level of a repair or even which tool is best for the job. Plus, participants earn points be making posts and contributing articles that they can redeem for free tools and apparel. 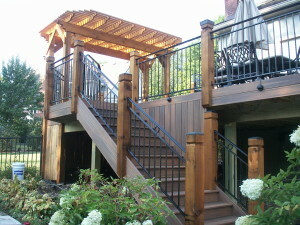 We encourage all of our customers who look for deck upgrades to check out Pinterest. This community is all about creativity and sharing the most creative and interesting ways of doing things on the web and in real life. What you’ll find a lot of at Pinterest is inspiration mixed with direction. A lot of the things shared at Pinterest are sets of directions, and it’s surprising how easy it is to build things like deck boxes for plants. Don’t be afraid to share what you find on Pinterest as well, it’s how you show the community that you prefer to contribute to the conversation too.